Another adventurous night in the Haight turned into an event filled experience. I had heard of a couple of things going on and I couldn’t quite decide which to cover so I ended up touching base at multiple places. 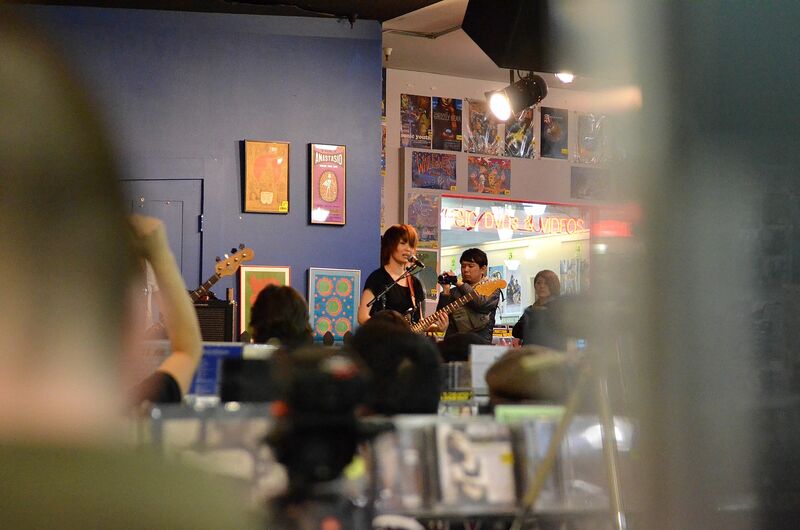 First off we have Amoeba Music who kicked off the week with an all ages free show featuring Japanese all-girl rock trio Stereopony.The band that originated in 2007 from Okinawa, Japan, drew in a crowd that swarmed the aisles of Amoeba’s CD racks. People found stools and steps to stand on to get a vantage over the crowd of about 70 people. The band is currently touring and will be playing at Slim’s tomorrow night April 10 if any of you are interested in going to check that out. Be sure to follow Amoeba on twitter for more upcoming in-store events! Not only do they post what their store is currently doing but they also like to help out with anything music related. So if you are into music they are a great feed to follow.